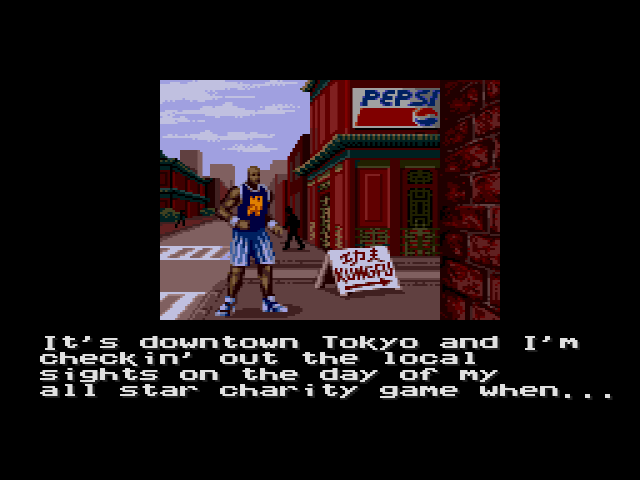 Very few video games are as infamous as Shaq Fu. A fighting game of the 16-bit era starring Shaquille O’Neal named after the NBA star’s rap album, the game is often considered one of the worst video games of all time. In case the idea of a fighting game based around a NBA star and named after said NBA star’s rap album wasn’t weird enough, the game’s story mode sees Shaq walking around Little Tokyo, where he stumbles across a kung fu dojo (forget the fact that Tokyo is Japanese and kung fu is Chinese). In this dojo Shaq meets an old man who deduces that Shaq is “the magic one.” The old man then opens a portal to another dimension, where Shaq must apparently save the life of a young boy named Nezu. Shaq jumps into the portal without a second thought. Because why not? 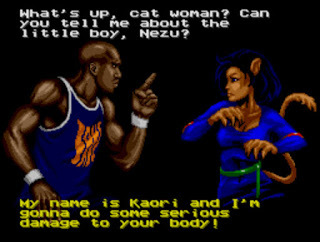 The opponents Shaq comes across are a parade of bizarre characters that include a cat girl, a voodoo princess, a hooded goblin-like creature, and a villainous mummy named Sett Ra, who kidnapped Nezu. So if you were hoping to see Shaq battle fellow NBA stars in another dimension, you’re out of luck. As bonkers as the story is, it’s actually the game’s highlight, as its utterly ridiculous nature can provide some good laughs. The sheer lack of context behind everything in the plot (who is Nezu? Why was he kidnapped by a mummy? Why doesn’t Shaq seem weirded out that he’s fighting monsters in another dimension? ), and the general absurdity of it all is just so silly it teeters in the “so bad it’s good” area. 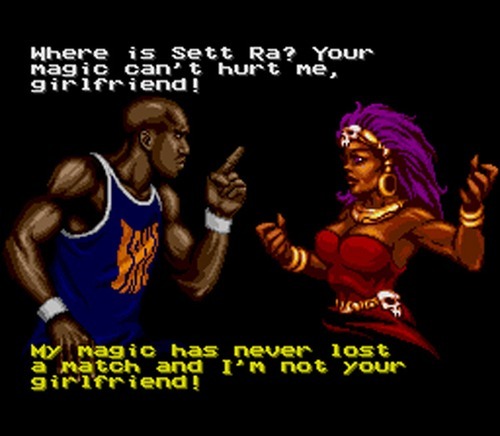 Shaq Fu’s true fatal flaw is its gameplay. Shaq, or the other characters if you’re playing versus mode, are all incredibly stiff. Moves just don’t flow very well, meaning combos are a non-entity. You basically just keep button-mashing and hope you get lucky. The jumping is the worst part, with Shaq leaping into the air about a second after you hit the button. The jumping is not only awful, but also ironically so, considering Shaquille O’Neal’s NBA background. The story mode also has an awkward difficulty curve. The SNES version has three available fights to choose from the start, and completing those opens up three more that are progressed in order. Some fights are so easy, you can just keep hitting the same button and win (in one fight I just repeatedly kicked my opponent who did nothing but block, which resulted in him losing enough health by the time the clock ran out that I won the match). Others are considerably more difficult, with the aforementioned cat girl, one of the initial fights, being a particular pain, along with the final battle against the mummy. Shaq Fu’s reputation proceeds it. It is a dreadful fighter that lacks any kind of depth, with a terrible sense of control and goofy visuals and animations to add a cherry on top. It may not be the most broken game I’ve ever played, but it’s certainly one of the worst fighters out there. It’s a sloppy, clunky, unpolished mess, made marginally more tolerable by its unintentionally comedic nature. In short, it’s far from an all-star. Well, that premise and dialogues are bound to give me nightmares…. hilariously terrifying nightmares. Shaq Fu is the best kind of nightmares. This is an amazing review for such a horrible game, ugh. But you made me interested and that’s what counts. I’m currently in the process of producing a retro gaming blog with reviews such as yours & I would love if you would contribute. E-mail me if youd like at theretroraider@gmail.com, if not I still think your writing is fantastic! Thanks for the comment and compliments! I will check out your site once you have it up (let me know when that is). I wouldn’t mind sharing some contributions with others. Did you play this game when it was released? I avoid bad games at all costs (or no cost when you think about it), so the only ones I end up playing are competently designed ones that make too many mistakes such as Yoshi’s Story. Also what would you say is the most broken game you’ve ever played? I usually try to avoid flat-out terrible games. Unless, of course, their terribleness turns them into something legendary. When I first saw Sonic Boom, for example, I thought it looked bad, and had no intention of playing it. But now that I hear it’s SO BAD, I’m really tempted to get it, once the price drops. But usually, like you, the only bad games I play are ones that had some kind of potential. I never played Shaq Fu back in its day, but with its reputation, I just had to track it down. As for the most broken game I’ve played. I’m not quite sure. I’ll have to get back to you on that one. I heard Sonic Boom is quite bad. Speaking of which have you played the legendarily awful Sonic 2006? I saw a Let’s Play of it about seven years ago and it’s amazing how bad it is. It would be interesting if you end up playing both games; you can decide which one is worse. Similarly, I considered playing Metroid: Other M because that’s another game that regularly ends up in the bargain bin. It’s amazing that a first-party Nintendo game could depreciate in value to that extent. I ultimately decided against it because one of my personal rules is that I cannot go into a game wanting to hate it. I want my reviews to be as unbiased as possible, so I go into games hearing that they’re good or interesting and draw my own conclusions once all is said and done. Other M is a mess of a game. I can’t even believe it. How do you make a bad Metroid game? But, well, they did. I might go back to it so I can review it here, but I’m skeptical. I also try not to have a set opinion on something beforehand (though sometimes it’s unavoidable. With Mario’s track record, for example, you kind of expect a new entry to be good). Expectations can’t be avoided altogether all the time, but sometimes they can be proven wrong for good or bad, or be proven right for good or bad. So long as someone doesn’t already have their opinion of something set in stone beforehand, it isn’t too much of a crime to have some expectations one way or another. Of course, when it comes to something like Shaq Fu, which is flat-out notorious, the preconceptions kind of come with it, and you mostly go in to see if it’s really THAT bad. You can try to be open-minded as much as possible, but that’s the kind of thing you jump into for the kicks as much as anything. I guess what I meant was that I want my opinion to develop as organically as possible. A lot of fun of critiquing comes from the fact that your opinion might be out of step with everyone else’s, which leads to a completely new perspective. There would be no point on playing Metroid: Other M now because I would be wasting my time coming down to a conclusion that’s already blatantly obvious. It’s been both panned and defended, and if I were to play the game and review it, I would be parroting many of the criticisms I’ve read about it (for the record, I would probably end up giving the game a 2/10). Otherwise, yeah, it’s nearly impossible to go into a game completely unbiased, especially if the brand has a good (or bad) track record. Good luck with those horrible Sonic games. If what I heard about them is true, you’re going to need it. I apologize in advance when the frustration reaches critical mass. You know what’s also as bad as Shaq Fu? Shaq’s acting career. Everything that he touches turns into crap (video games, movies). Well, except sports teams (Magic, Lakers, Heat, etc. ).